Though not covering as many aircraft as most of the Air Wing sheets, this one has two very colorful aircraft. First is an AD-6 (A-1H) Skyraider. It is the CAG bird from VA-65 and includes the multi-colored tail band so typical of these aircraft. No time period is given, but it has to be before late 1962 when the US military went to common designations for aircraft. The other is a VF-33 F-8E Crusader. As with the previous aircraft, it is in light gull grey over white and quite colorful. For kits, you have the older Hasegawa and Heller kits. Most feel that the Heller is a better choice in terms of overall shape. Neither can be called modern kits. Allegedly, Academy is bringing one out, but that has been on the 'soon' list for several years. There are enough insignia for one full plane and enough data markings for both. 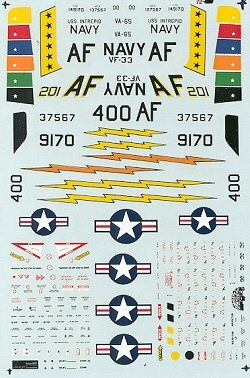 For kits, the A-1 is well represented by Hasegawa, Fujimi, Airfix and Takara. Most will pick the Hasegawa or Fujimi versions.